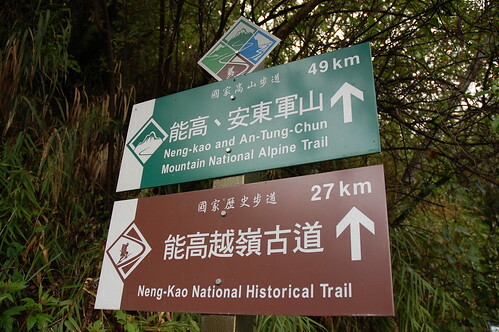 The Neng Gao Historic Trail 能高越嶺古道, like so many of Taiwan’s Historic trails, was originally built by the Japanese to help control and subdue the aboriginal tribes that lived in that area. 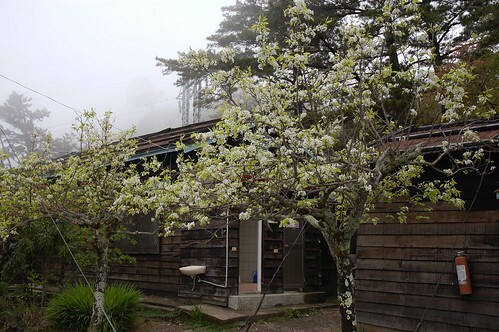 After some time, the occupying Japanese began a project to use the trail to build and maintain power lines that run from the west to the more remote east coast but this was delayed by the onset of World War Two. Eventually the power lines were built by the Taipower company after the Japanese left Taiwan and they still remian today. As this weekend was the Tomb-sweeping festival, we set off from Taipei for Nantou 南投 at around 3.30am to avoid the worst of the traffic. It was plain sailing and we arrived at the police station in Lushan 廬山(the last one you come to) at around 8am. The policeman seemed a bit bewildered as to why we were bothering with the permits but it’s always best to do these things properly in-case something goes wrong on the mountain. From the police station it was a steep drive up a very dodgy road to the trailhead and car park. 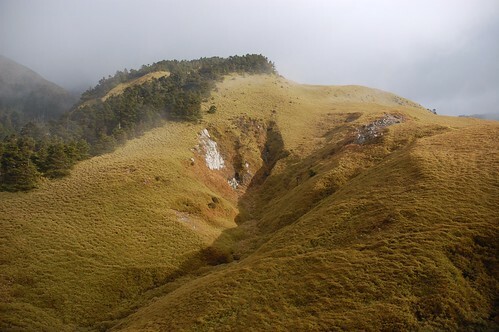 The rock in the part of Taiwan is mostly shale and slate and it is very prone to landslides. As soon as we started on the hike, we came to the first sections of missing road. However this was over very quickly and the road was in a decent state for most of the way to the first hut. 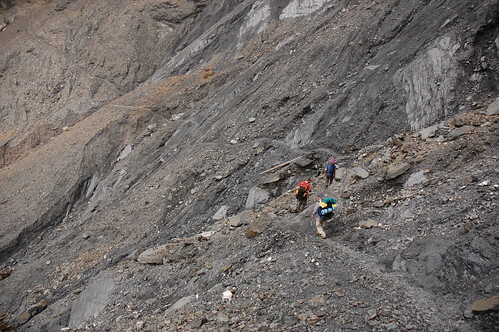 After a quick break at the hut, we carried on and came to the first of two huge landslides. It was very eerie crossing the scree and broken shale in the mist as we couldn’t see the bottom of the valley and had no idea just how far we could potentially fall. 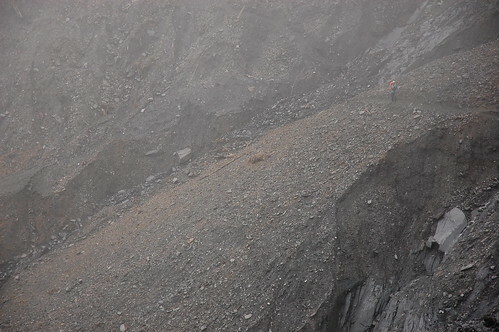 The whole landslide is about 1km long and when this part of the trail went, it must have been a tremendous sight. After the landslides we continued along the path. It got steep in a few places and very precarious in others. Amazingly there are some people who still drive motorbikes along the trail though it seems they have a number bikes staggered and walk across the worst parts to the next bike. 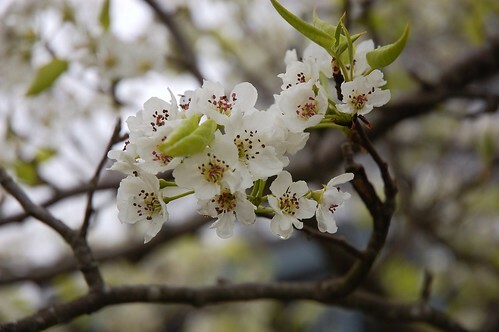 All along the trial we spotted white and pink flower blooming and the path was also covered with the fallen petals. 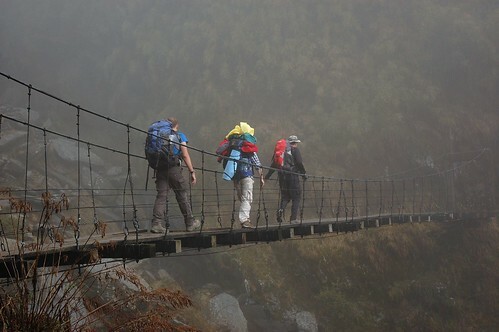 They are several suspension bridges to cross, all of which have a limit of five people and luckily for us we had that exact number in our group. The final bridge passes by a 3 tier waterfall that has a beautiful pool at the bottom which would make an awesome place to cool down in in the summer time. At about 3pm we made it to the Tianchi Cabin 天池山莊. It’s fairly grotty but the camping ground outside is nice. 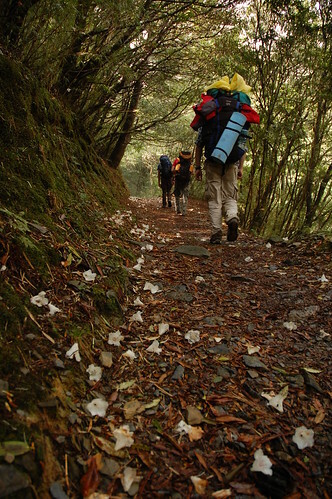 We considered staying there but as it was still early, we decided to carry on up trail to the Tianchi pond. This part of the path is super steep and we could all feel the altitude. Also the weather began to close in and by the time we got to the lake, we were surrounded by mist with an absolute gale blowing. 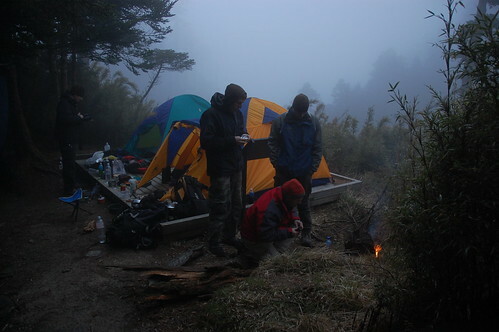 It was freezing cold and so we went back down the path about 5 mins to a more sheltered wooden platform and set up camp for the night. 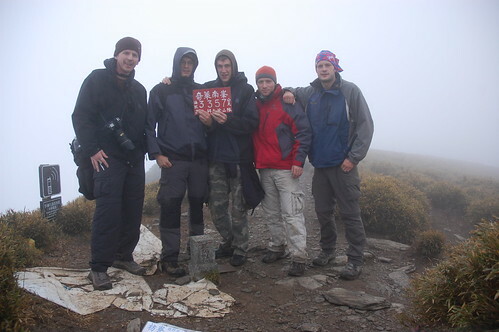 The next day we were up relatively late for us, at 6am, and headed up towards the Qilai South Peak. The mist from the previous day was still there as was the wind which made it hard going. Enjoying the views on the peak! Unfortunately there were no views from the top but as we descended the clouds would briefly disappear giving a us chance to see some of the surrounding peaks and valleys. 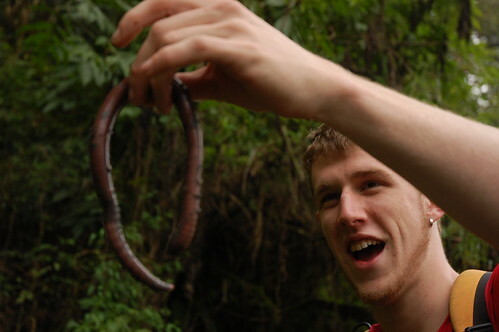 Jason's never seen one that big! After packing up we walked back out the same way we came in, passing by loads of cyclists who were spending a day riding to the Tianchi cabin and out. The weather also got a bit better and we all managed to get slightly sunburnt! 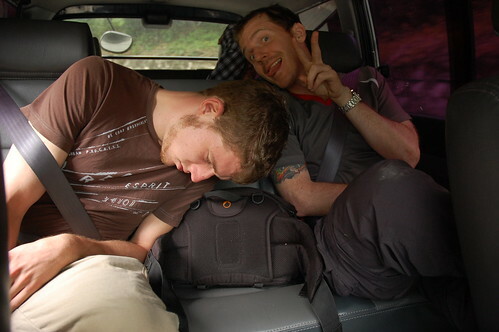 We were all really tired after the hike, some more so than others! Itineries – There are so many different itineries to follow here. In and out like the hike we did just requires 2 days. However with more time it’s possible to hike all the way over to Hualien but a trip like that would require a driver at either end to drop you off and pick you up on the other side. 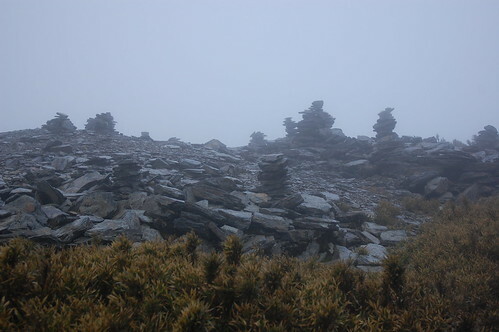 Another possibilty is to hike the whole of the Qilai ridge and come out on Hehuanshan or even head south and hike to Aowanda. Have look at Sunriver maps for some ideas of times and distances. 3. A schedule plan – This is your intended plan and an utterly useless map that looks like it was drawn by a three year old! The one in the link may need to be changed depending on your own plan. Ask a Taiwanese friend to help if you can’t read/write Chinese. And that’s all….. I always like to get this all done before I head out as it makes registering at the police station so much easier and quicker. 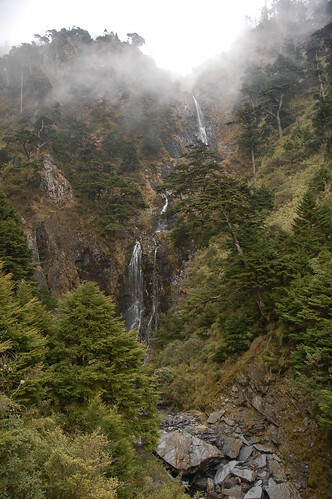 The hike – There are lots of sources for water along the way. The Tianchi cabin has running water and toilets. Though it’s always best to boil the water before drinking it. The Tianchi cabin can be booked. Call 049-2982155 to make a booking. If going on the weekend, plan to book early as the spaces go quickly. THE CABIN NO LONGER EXISTS. A NEW ONE IS CURRENTLY BEING BUILT SO HIKERS MUST CAMP. Loads more photos here. Click on the link for the map below to get driving instructions. 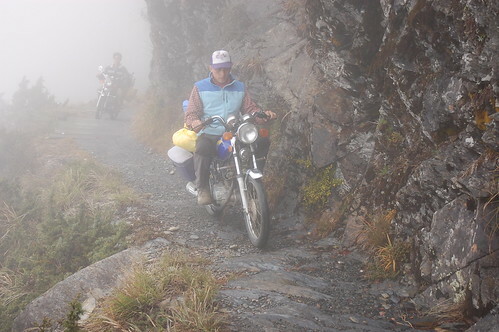 Way to go Stu… it was a cold and foggy during those 3 days of tomb sweeping. 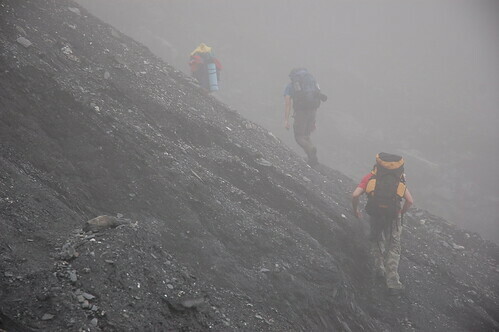 At Mt Hehuan we could only see 5 meters ahead of us. When I was there, there were loads of people doing it on their bikes. You’d only be able to get as far as the Tianchi cabin but i’m sure it’d be a great trip. Just be careful on the landslide sections! Hey Stu…. I think your RSS Feed is not working. Might want to have a look otherwise might be mine Google Chrome. Thanks for letting me know. I’ll have a look at it ASAP. I couldn’t find your email address anywhere, so I’m writing here. Thanks a lot for maintaining this blog, it’s been a great inspiration for my planning of a trip to Taiwan. 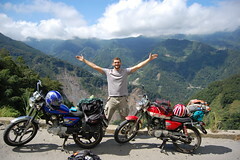 I’d like to do this trip, but get to the starting point from the East Coast – through Taroko Gorge. Do you think it’s possible? Yeah, that road is still open. It’s an amazing drive too, just be careful if the weather isn’t looking good. Might also be worth stopping at the visitors centre in Taroko Gorge to make sure that the road is in good condition before you head up that way. That sounds great, thanks! One more thing I want to make sure about – the permits. Isn’t it ok to just stop by in the last police station (Lushan in this case) and ask for a permit just there (without any papers in hands)? A friend of mine went to Jiaming lake a year ago and they did just that. That’s right, it’s fine for Nenggao to just turn up. Usually you only need to apply in advance when you need a national park entry permit or if you want to book into the Tainchi cabin. Enjoy it! Hi Stu. 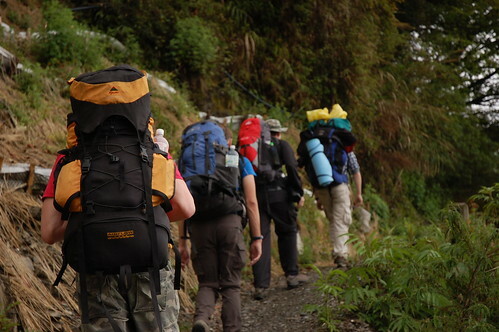 Congrats on this is a great site… tons of good hiking info. I come to Taipei often for work and will be again next week. Any idea who I can contact for hiking partners, like for a trip the Nov. 26 weekend. Maybe something around Wuling Farm. Thanks, Ilan. Not sure where you’d find a hiking partner for Wuling. Most of the big hikes in that area require permits and you’d have to get that sorted out ASAP. How about anywhere else in the north that is a weekend (or long weekend) trip from Taipei? Any hiking clubs you know of that I could contact? You could have a look at these guys http://523.org.tw/ They speak English and organise trips from time to time. Or there’s barking deer http://www.barking-deer.com/ but it’ll be very expensive to try a trip on your own. We’re doing the Neng-Gau trail this week (departing Taipei Wednesday 11/24 for LuShan and a hotspring hotel, trailhead Thursday (to Tien Chi), friday to Cilai S. Pk & others), Sat back to hot spring then van to Taipei. Our van has space for two more people. Call me at 0938-190-563 or (02) 2834-4264 or 2873-9900 x352 ASAP if interested. 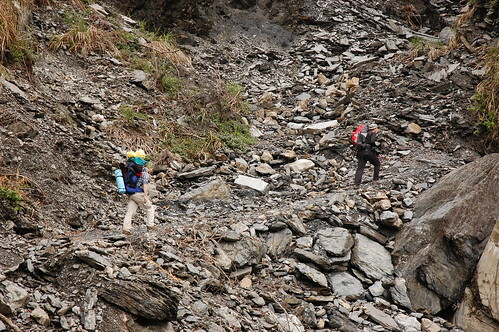 No guide – my 2nd trek on Neng Gau trail though. I just went up there with my father. The new hut will be huge and is still under construction. They have provided some mini places for camping, which were all pretty muddy after the long hours rain during the night. Better do not plan there to stay at that place until the hut is done. There are better places to stay over night further up which i had used before including water supply. The path had been made ready for mini cars to use all the way to the site for transport. The overnight rain has caused some slides and some bolders to come down, destroyed the bridge (I saw the bridge already several times repaired over the years. So be carefull even at this hike during rain season. Some people look strange at me because I carry at all hikes a rope (50m half rope), but its a good life insurance. I did many hikes during winter and summer in this area and there is a lot of potential because not many poeple out there besides the ‘family trip’ chilia shouth. We were actually planning to revisit Nengao last weekend, but the prospect of typhoon rains put us off. Crossing those landslides in heavy rain would not be much fun. 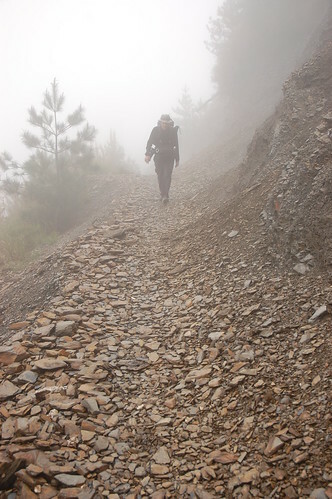 Have you ever done the hike all the way to Hualien? I’d love to do that or head north up to Qilai Main Peak, just never have the time for it! After a long downhill trek to the trailhead we enjoyed a hot spring bath in the (new) Lu-shan village. Our local aboriginal driver was “Jeffrey,” Tel 0980-693-669. He has a 4×4 van. Ask him about how his grandparents’ battles against the Japanese! Sounds like a good hike, though unfortunately I couldn’t get the link to your photos to work. We had a similar problem in that the cabin and surrounding area were a bit of a mad house. So we headed up to the pond to camp, but the wind was terrible and in the end we finally set up camp on the wooden platform halfway up to pond. I did never the way down to Hualien, because I love to be out of the tree line. The way to main peak and further north going down is pretty niceand exciting and exhausting. I did it last December in a 2 day trip. I know some places to stay over night, on the way. I might do the trip in a view weeks. Impact of water (landslides) is very minimum at the ridge. But going down the way at the north requires to use the stream bed, which is tricky during rain. But going the way back from the hut near the main is not bad as well. And here is what happens when you do it on a mountain bike! http://heresjonny.com/blog/2011/07/16/nenggao-mtb-the-return/ – awesome information by the way – really helped with our planning. I’m glad you found it useful! Looks like an awesome ride on the bike by the way. I’m trying to find some recent information about this hike. 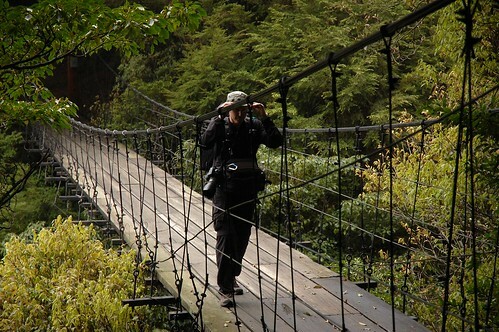 We visit Taiwan in december and would like to hike around Nenggao (only a dayhike). 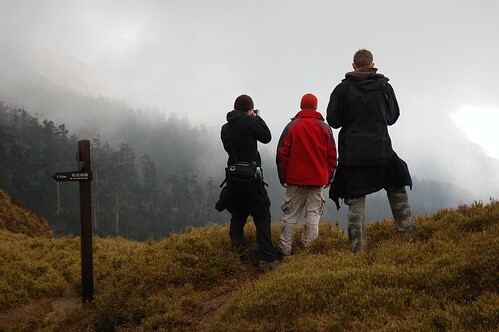 I was wondering if it is possible without a guide (we are sportive and experienced hikers in the Alps), for example going there and back to the Line Station, or to Tianchi lodge and back. And is the weather usually ok in December, we don’t mind cold? It’s possible without a guide. You should apply for a permit at the police station in Wushe. 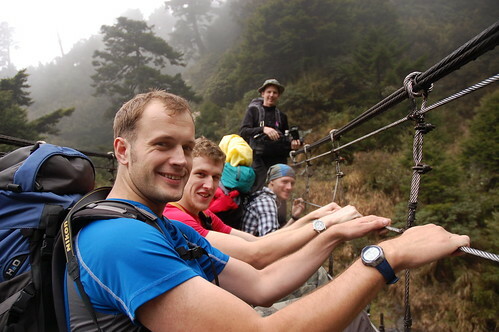 It’s 32km round trip with about 1500m in elevation gain if you do the Qilai South Peak. It’s 13km to the Tianchi Lodge. If you have a tent you can camp outside the lodge. Tnx for the reply Stu! Hi! 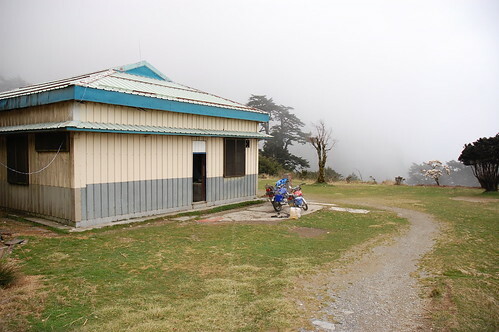 This might be a stretch, but is it possible to go from Tianchi lodge to Hehuanshan East peak trailhead in one long day? What is the snow pack usually like in late March? Thanks in advance!! You’d probably want three days for that. The ridge between the south peak and the main peak is sketchy in good conditions. There isn’t really a snow pack. If the weather’s been cold recently, there’ll be snow up there but it never lasts for long. You can also search at strava, so you can doenload the trail on a gps tool. The path is not difficult to follow though.